Smartphone dongles and adapters can tend to get a bad rap, seen as unsightly and unnecessary add-ons that ruin the curved aesthetic of a smartphone, and become just one more thing to forget or lose. But used right these plug-in peripherals can help you do more with your phone than you ever thought possible, here are five issues dongles actually solve. With tech like the Chromecast and Apple AirPlay around, you’ve got plenty of choice for getting your smartphone display up on a big screen, whether you want to watch videos or play games. Getting a wired setup together can often prove faster and more reliable though, and works away from your home wifi too. Behold the Apple Lightning Digital AV Adapter, yours for $49, which provides the missing link between your iPhone and the HDMI cable trailing out of your 4K TV (or your office projector). You can beam apps, presentations, websites, movies, TV shows and more, though you’re limited to 1080p resolution. For Android you need something similar but for microUSB or USB-C. This $50 USB-C to HDMI adapter from Samsung will do the job, and like the iPhone your Android device will automatically detect the new connection and start mirroring content accordingly. You do need to check your phone’s specs though—the Pixel 2 and Pixel 2 XL, for example, simply will not output video over their USB-C ports, possibly to encourage you to go and buy a Chromecast instead. If you’re going to need this kind of functionality on your phone, you need to make sure it’s supported. Microphones may not exactly qualify as dongles or adapters but we’re going to include them anyway as compact accessories that can quickly boost the capabilities of your smartphone. Unfortunately the demise of the headphone jack means it’s currently rather tricky to find decent models. If the 3.5mm audio port is still present and correct on your phone, then something like the $40 iRig Mic Cast will get you substantially better audio than your phone’s built-in microphones can, especially if what you’re recording is more than a few feet away. If you’re recording someone or something in particular, consider a shotgun option like the $55 Movo Shotgun Mic (it comes with a filming handle too). For iPhones, many a mic will plug straight into the Lightning port, with the Shure MV88 one of the most widely recommended choices – it’s expensive at nearly $190 but it comes with a windjammer and will get you good results. If you do a lot of field recordings with your iPhone it might be worth investing in. If your phone has neither a 3.5mm headphone jack or a Lightning port, you’ll struggle to find something suitable (the USB-C portable mic market seems to have been slow to take off). Your best option might be to buy a USB-C to 3.5mm adapter and then connect up a microphone to your smartphone that way. Did you know you can plug USB storage devices straight into many Android phones? You do now. For older microUSB phones you need an On The Go (OTG) adapter cable – like this $5.49 one on Amazon – and you can then just plug one end into your phone and the other into a USB stick or portable drive. With a USB-C port on your phone, you can either buy an adapter that converts USB-C to the more conventional USB-A connector type, or get a USB-C drive and cut out the middleman—this 128GB memory stick from SanDisk would do the job and is less than $35 from Amazon at the time of writing. Android actually supports these storage devices natively, so you can see the drive, its folders, and its files in any file manager you have installed on your device. Some storage drive manufacturers (including SanDisk) also offer their own apps for quickly getting files off your phone and freeing up space. 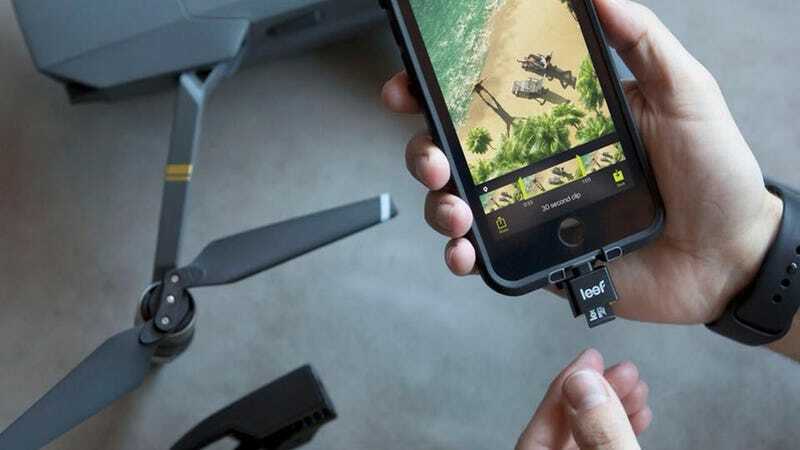 When it comes to iPhones your options are a little more limited—you need to pick up a device specifically made for the iPhone, like the $80 Leef iBridge 3, with 64GB of memory. This device and others like it come with an app to help you manage storage and files: You could, for example, load up some movies for the kids to watch on a flight. No one would say it’s ideal having to plug in a dongle between your phone and your headphones, but it does at least let you keep using those high-end, expensive wired headphones that you’ve grown so fond of. If you’ve paid several hundred dollars for them then you don’t necessarily want to go out and buy AirPods too. Not only that, it lets you use the same pair of headphones across multiple devices – you just need the right dongle for each one. It’s instant, reliable, wired audio, and no need to charge up your headphones every other day ahead of your commute. As an added bonus you can plug your phone into your hi-fi system at home as well. As you may have seen, Google just introduced a new and improved USB-C to 3.5mm adapter for its Pixel phones. Sure, it looks very similar to the original, but Google promises lower latency and less of a power draw for your extra $3. If you’ve got an Android phone with USB-C, it’s worth paying a little more for a cable you can actually rely on. On the Apple side of the fence you won’t get a Lightning to 3.5mm adapter with this year’s iPhones, but Apple will sell you one for $9 (even if it would much rather you forked out the $160 for some AirPods). It’s going to be interesting to see exactly which ports Apple includes on the next iPad Pros. Today’s top-end smartphones are powerful enough to enable you to get on with some serious computing, and this year’s Samsung flagships once again support the DeX protocol for hooking them up to a mouse, keyboard, and monitor. DeX has been simplified with the Galaxy Note 9—now you only need a USB-C to HDMI adapter or cable to do the job (yours for $50), whereas on older Samsung phones you required a full-on dock (yours for $70). You can still use the dock on the Note 9 if you want, because you do get some extra ports out of it. As you would expect considering Samsung has made such a noise about the feature, everything works automatically once the cables are connected and the monitor and peripherals are detected. By default you just see a duplicate of your phone’s screen, but you can switch to DeX mode using the menu that appears on screen. Huawei is another manufacturer exploring this kind of tech: Huawei Desktop Mode can perform DeX-like tricks on the company’s flagship phones from the Mate 10 onwards. Again, you just need a monitor and a USB-C to HDMI cable to get it set up.